Ideal activity for people of all ages looking for some adventure, Sea Kayaking is a great way to explore the promenade and the near-by islands. The tour includes a guided visit to the lagoon, a gourmet lunch and activities like hiking, swimming and snorkelling! 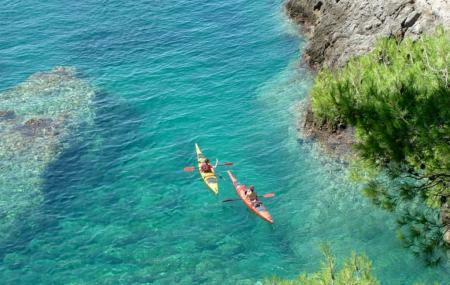 How popular is Sea Kayaking Cavtat? People normally club together Bar Kamen Mali and Cavtat Cemetery while planning their visit to Sea Kayaking Cavtat. Mario was a fantastic guide, very patient and spoke fantastic English. We had a great experience touring around the island. The whole experience was easy and the area is beautiful, highly recommend to couples and groups, a great way to view Cavtat! Would love to do it again. Thank you Mario! Fantastic little kayak hire place. A really friendly couple run it with their gorgeous little dog. Really reasonable price 100 Koran for an hour. Beautiful sights, great fun, I'm so glad we did it. Our guide was exceptional. Friendly, funny, and full of interesting facts. So much better than the busy Dubrovnik tours. This was a personable experience we will not forget.